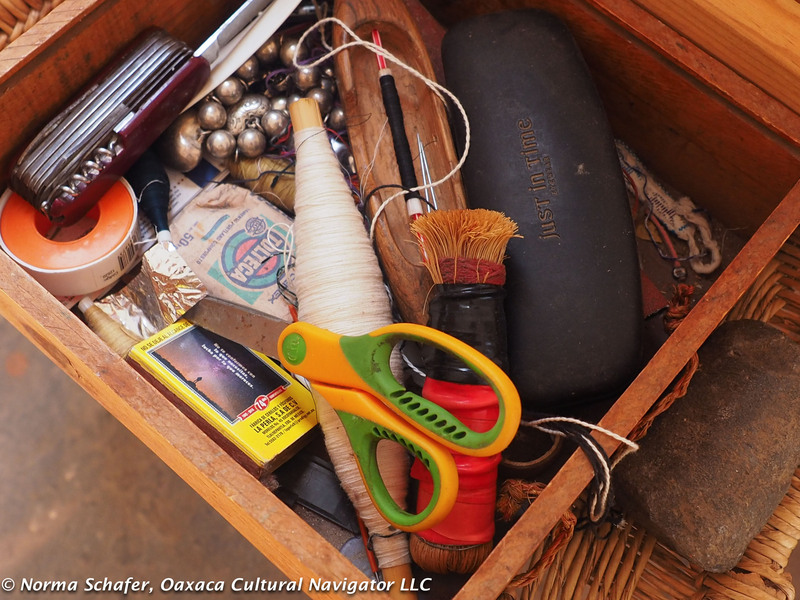 In my getting ready to go back to Oaxaca from Durham, NC, I’m going through the boxes of my collection to decide what I’m ready to send off from my house to yours! 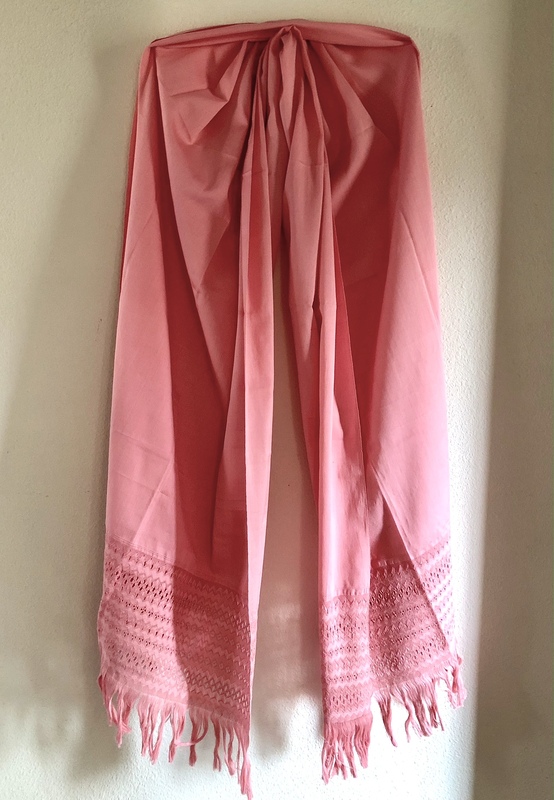 My departure date is June 22, so please, if you are interested in making a purchase, let me know immediately, and I’ll mail to you as soon as I receive payment. Mail deadline is Wednesday, June 20. Eight pieces offered. I will send you a PayPal invoice that includes $8 USD postage. 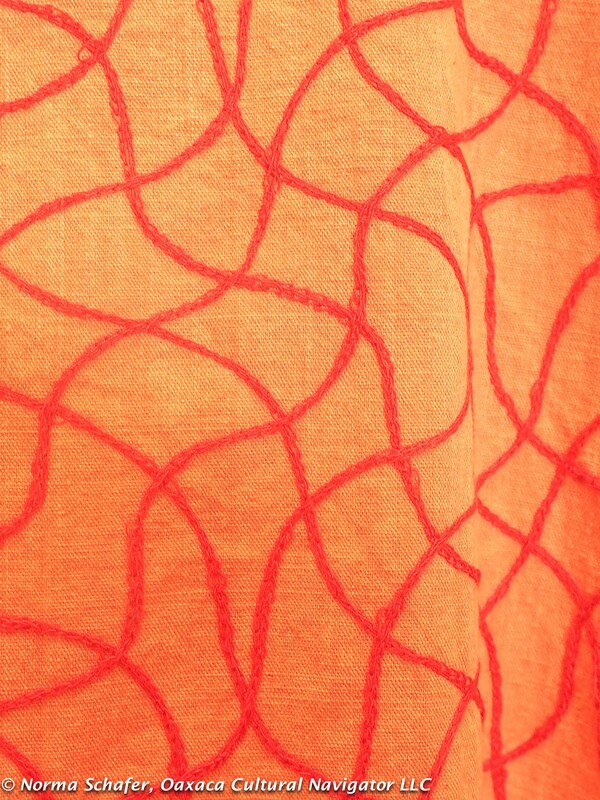 Also see my last post for Summer Frocks — big price reductions! #1. SOLD. 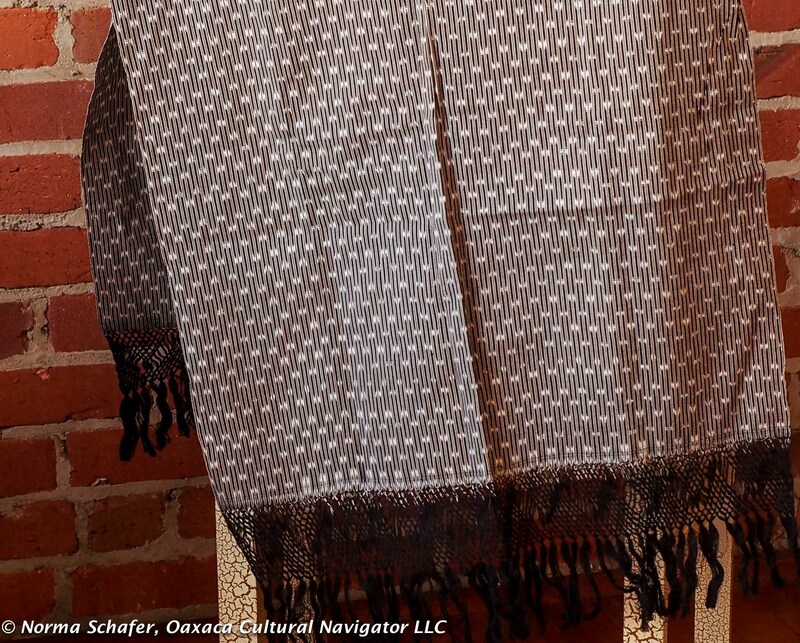 This is a hand-spun native Oaxaca cotton gauze shawl embellished with local coastal figures like crabs and seahorses along with traditional symbols of fertility and wildlife. 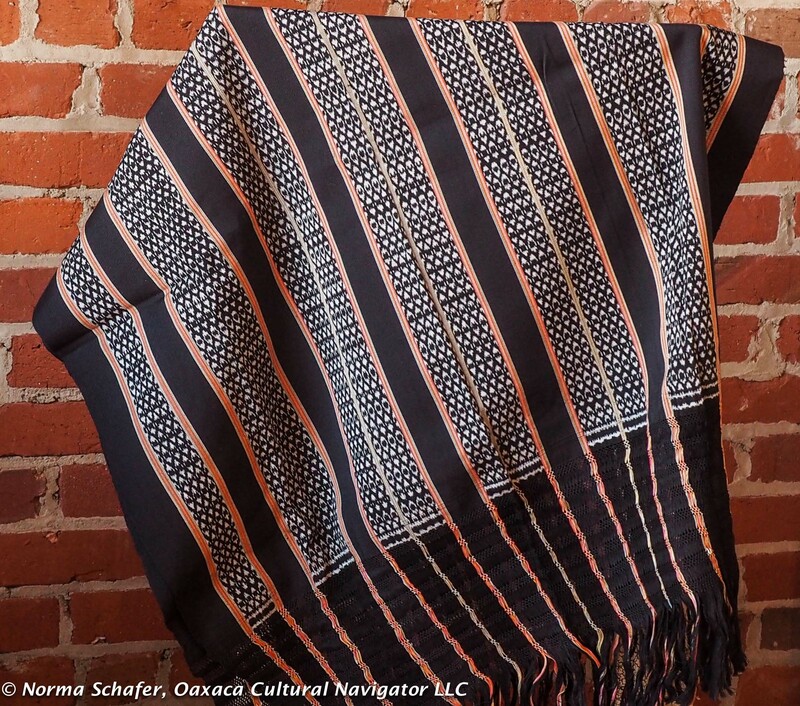 The brown is rare, native coyuchi cotton and is part of the woven cloth, called supplemental weft. 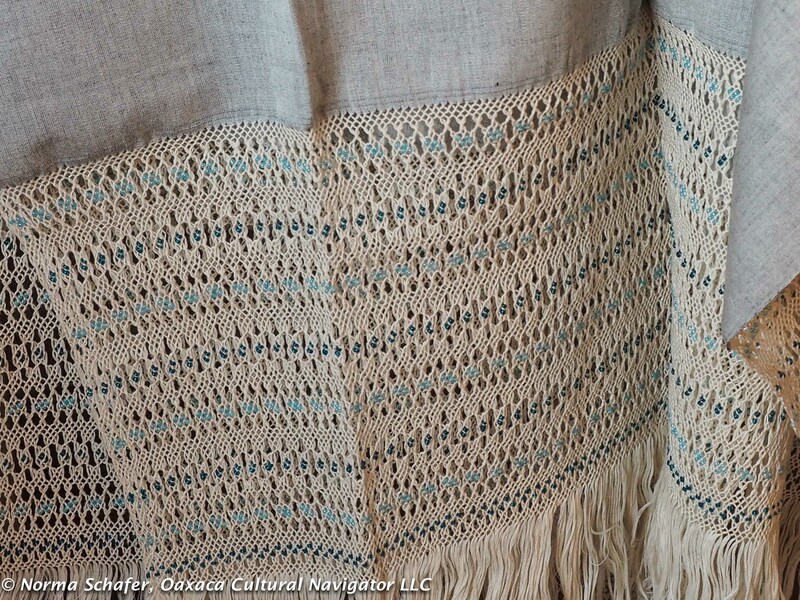 Measure’s 22-1/2″ wide x 86″ long — long enough to serve as shawl, rebozo or stole or a throw over a favorite chair or bed. $125 USD. #1. 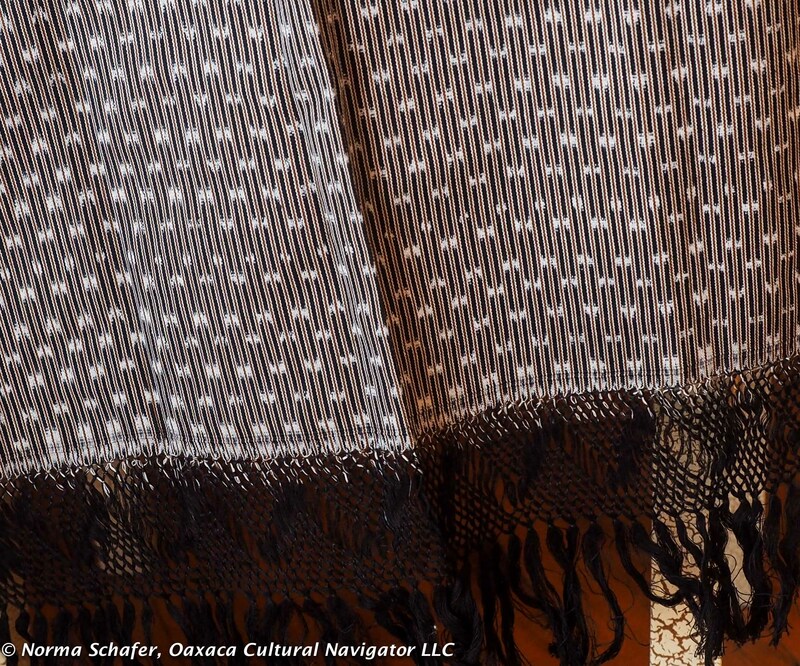 Coyuchi and white cotton rebozo detail. Is there a summer wedding or garden party in your future? 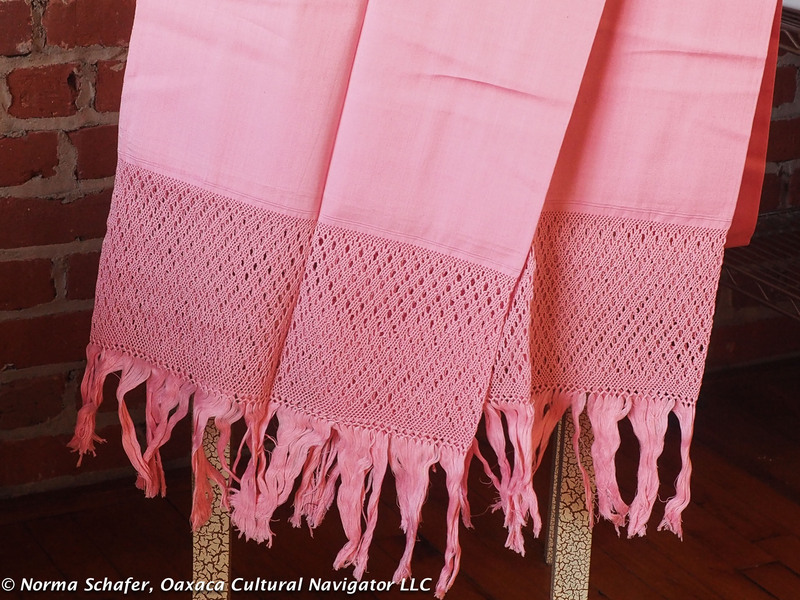 #2 SOLD is a fine quality jacquard rebozo, hand-woven on a fly-shuttle loom with the finest cotton hand-dyed with indigo and cochineal and banana bark. 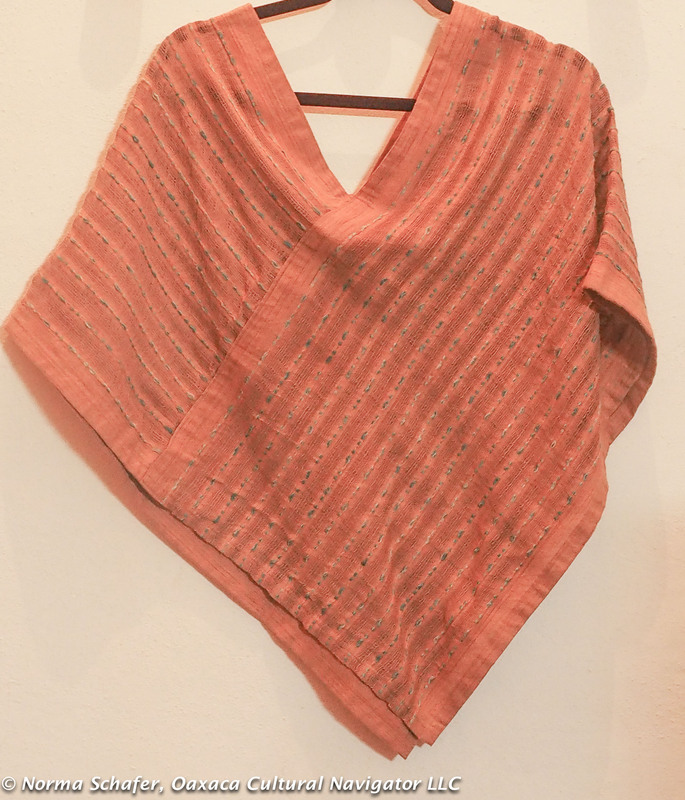 It comes from the Oaxaca village of Tlahuitoltepec where one weaving family creates all natural dye cotton textiles. 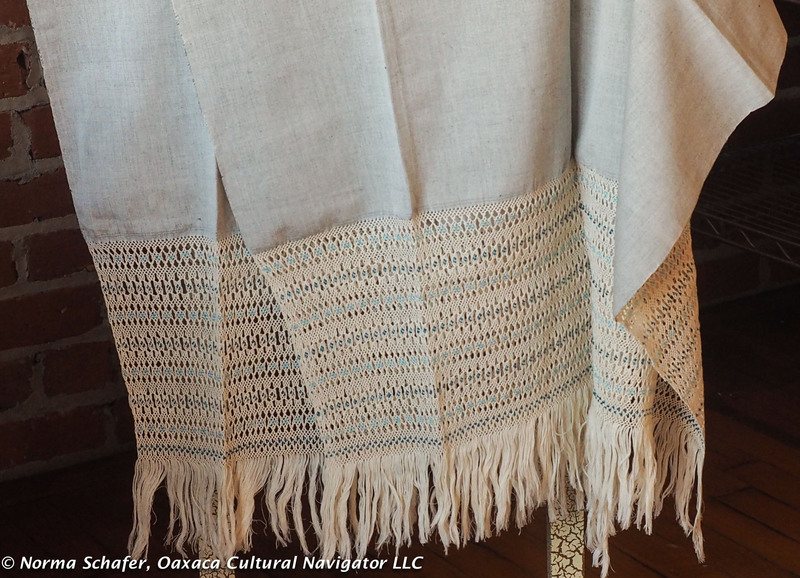 Measures 25″ wide x 88″ long (including the macrame hand-knotted fringe called the punta). $145 USD. Will you be dining al fresco and want the perfect wrap? 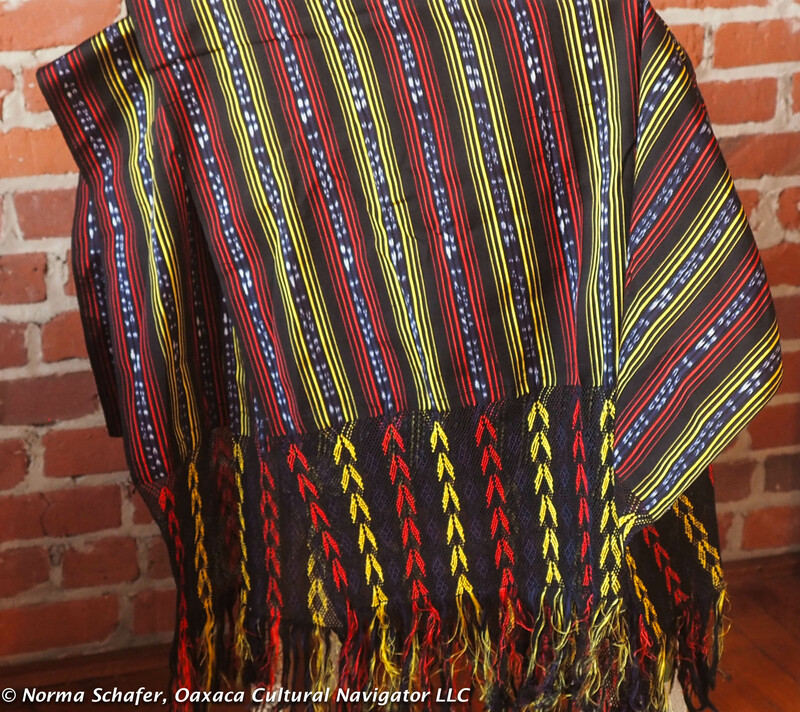 #3 SOLD is a multi-colored shawl/rebozo that includes hand-twisted fringes. It will go with anything! 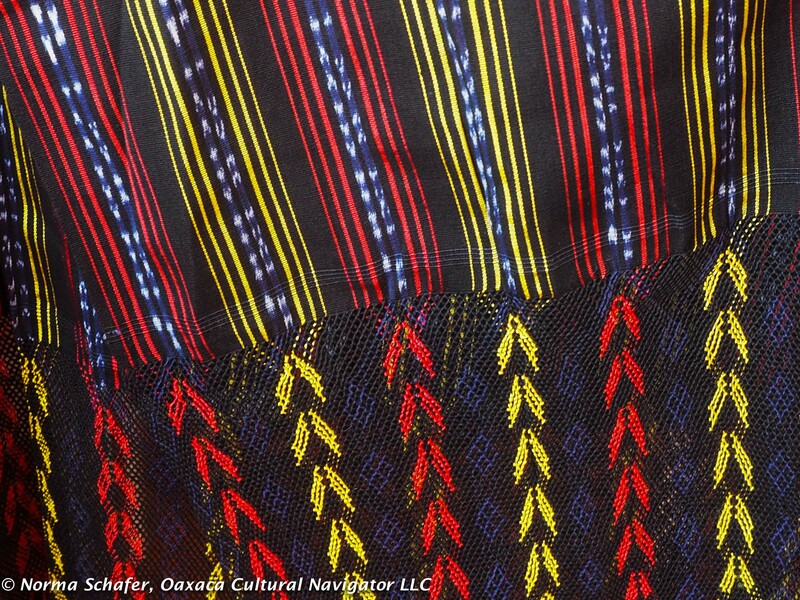 The textile was hand-woven on the back-strap loom in a remote Oxchuc village by Catalina, a young mother who learned from her mother, who learned from her mother! 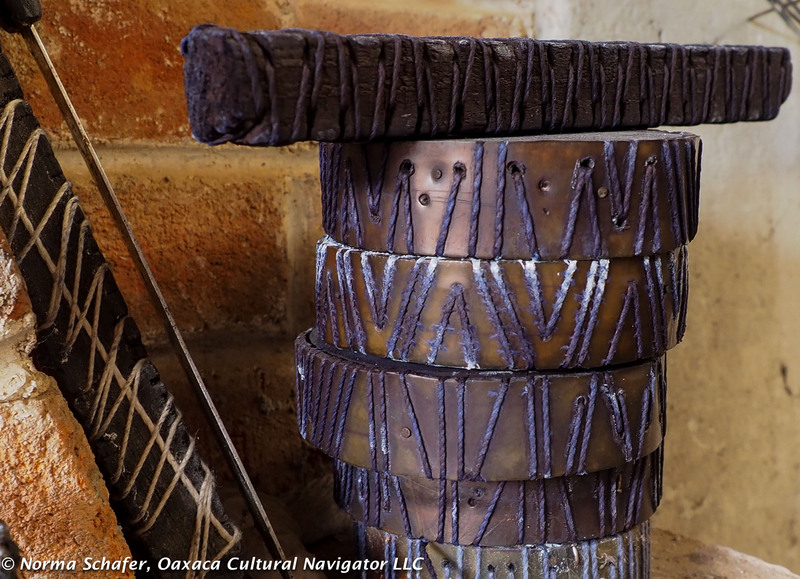 To keep the tradition going it’s important to have buyers, so I chose to support them and bring their work to you. 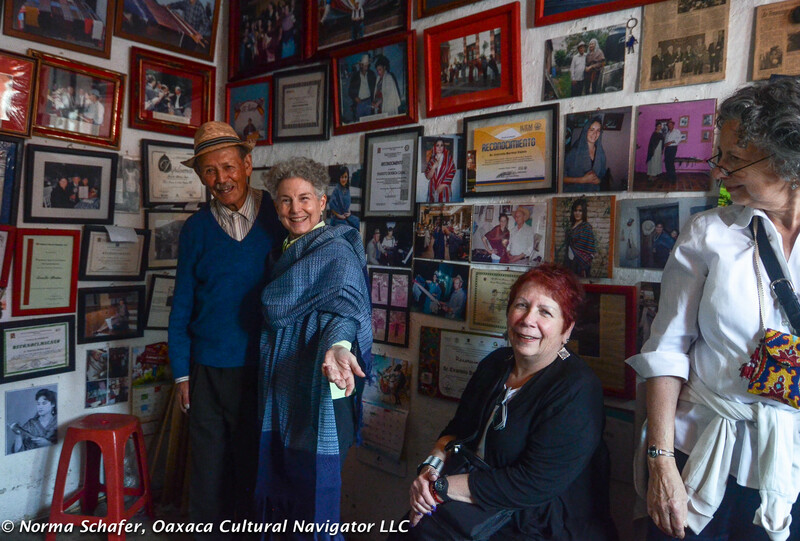 The village, where I visited, is about an hour and a half up the mountain from San Cristobal de Las Casas. 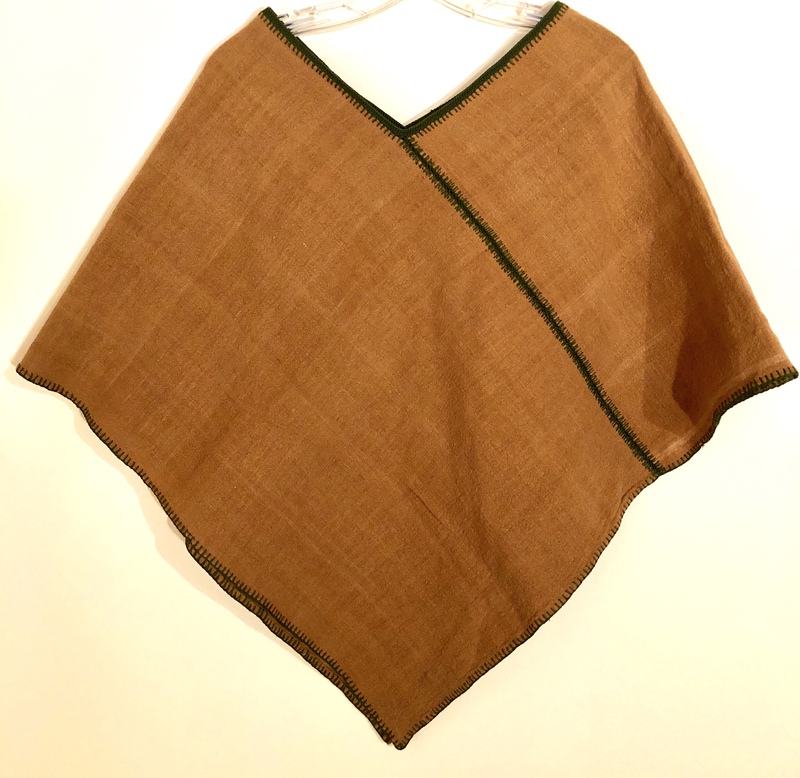 Measures 23″ wide x 78″ long. $145 USD. #3. 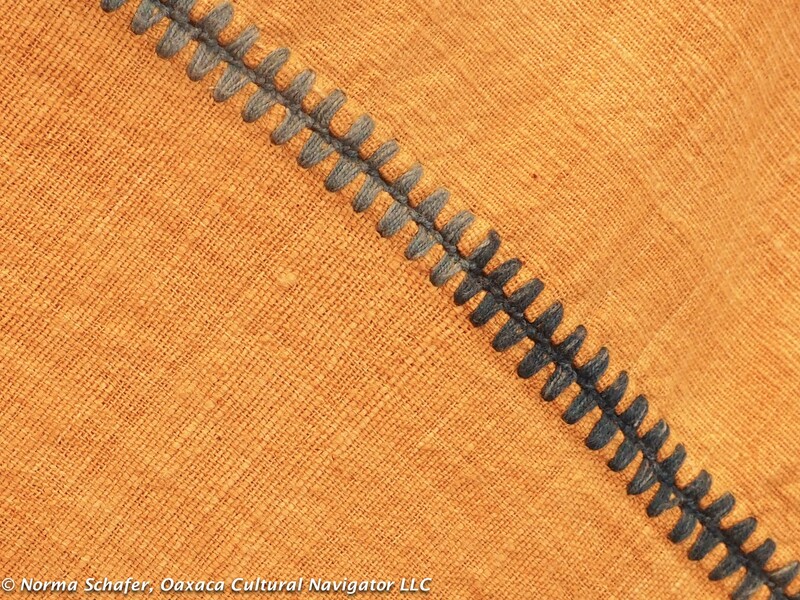 Detail, Oxchuc rebozo, called a Chal in Chiapas. What about that summer concert under the stars? 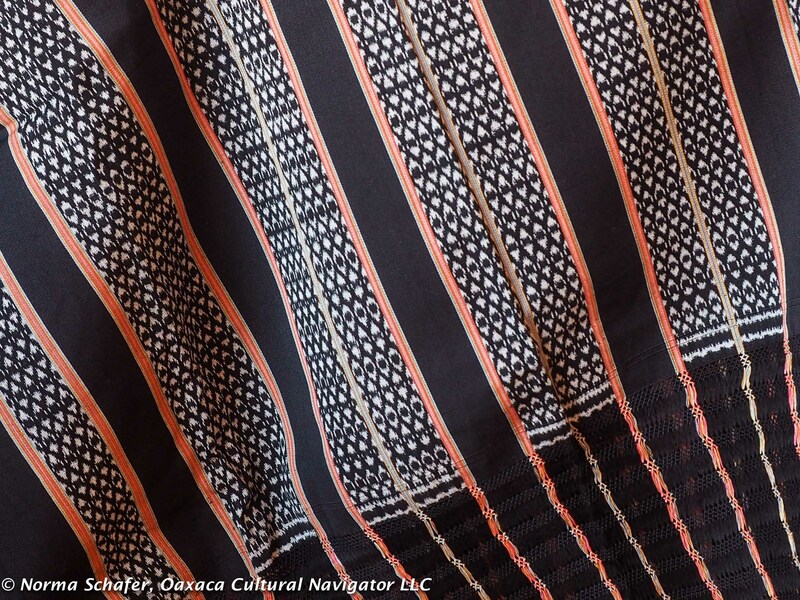 #4 is a beautiful white shawl hand-woven on the back-strap loom and embellished with red, rust, yellow and purple accents in designs unique to the village of Venustiano Carranza. 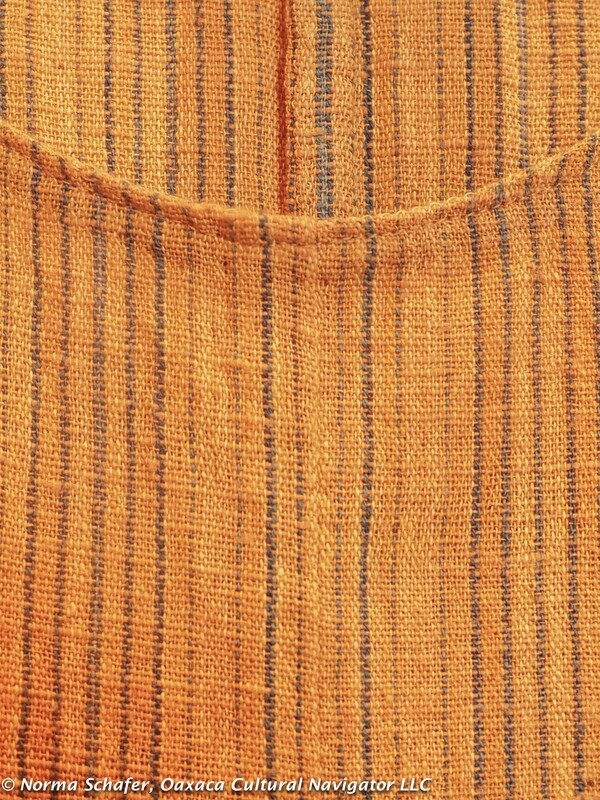 The region is closer to the Pacific coast and gets pretty hot and steamy, so the fabrics woven there are lightweight cotton and comfortable. 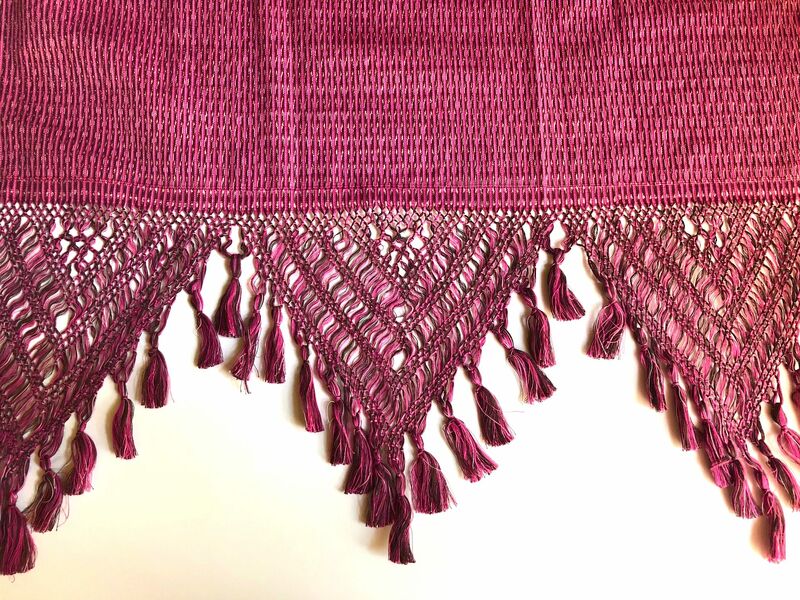 Drapes beautifully. 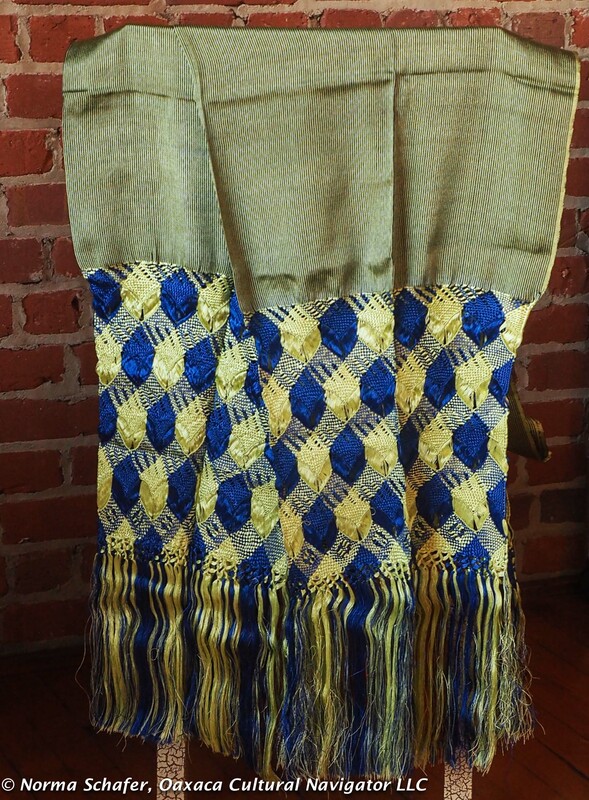 Measures 26″ wide x 76″ long. $135 USD. 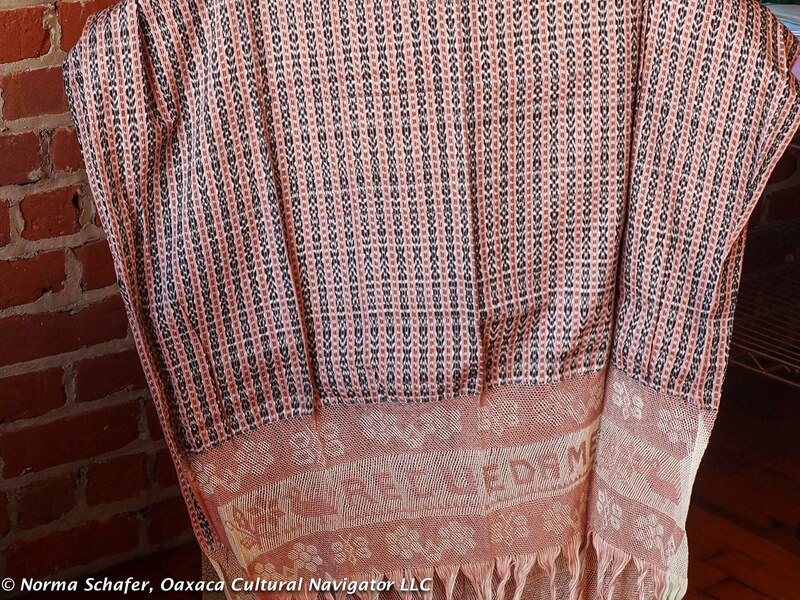 #5 shawl from Venustiano Carranza is a beautiful, subtle luscious peach color cotton woven on the back-strap loom. 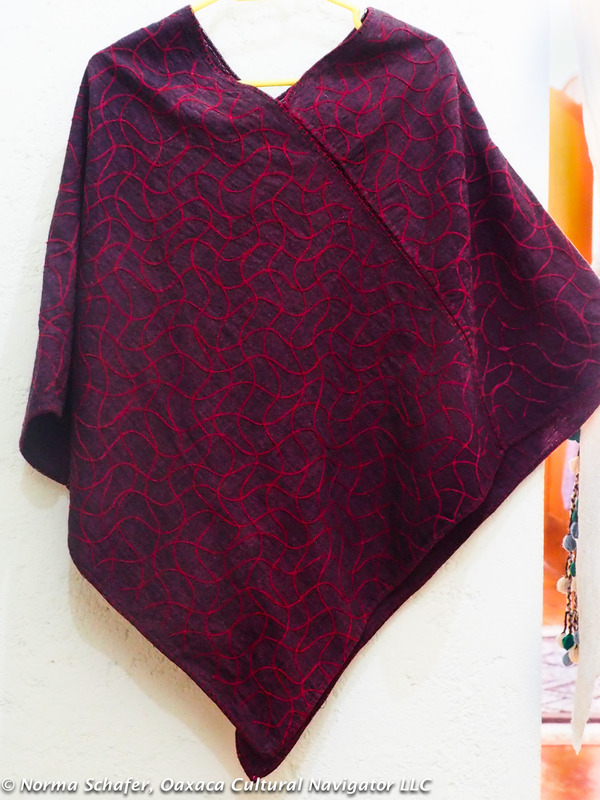 Imagine this draped over your shoulders. 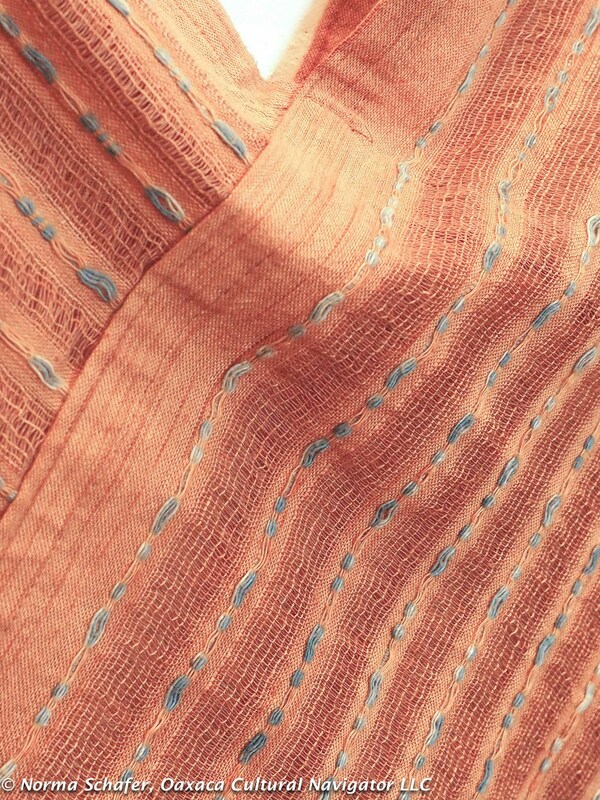 The design that is woven into the textile is also a contrasting peach color using thread that has a sheen. 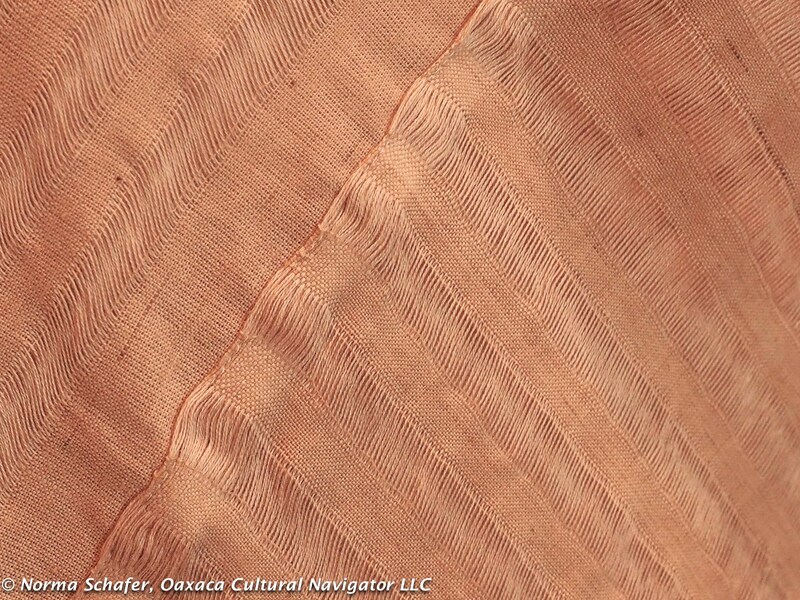 This gives a lovely matte-shiny finish to this piece. 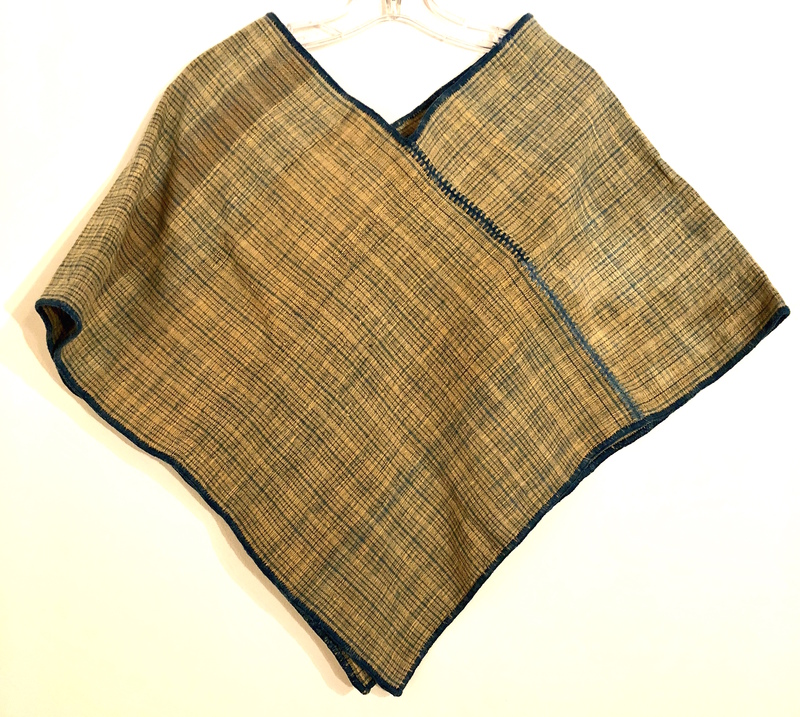 Measures 26-1/2″ wide x 80″ long. $135 USD. SOLD. 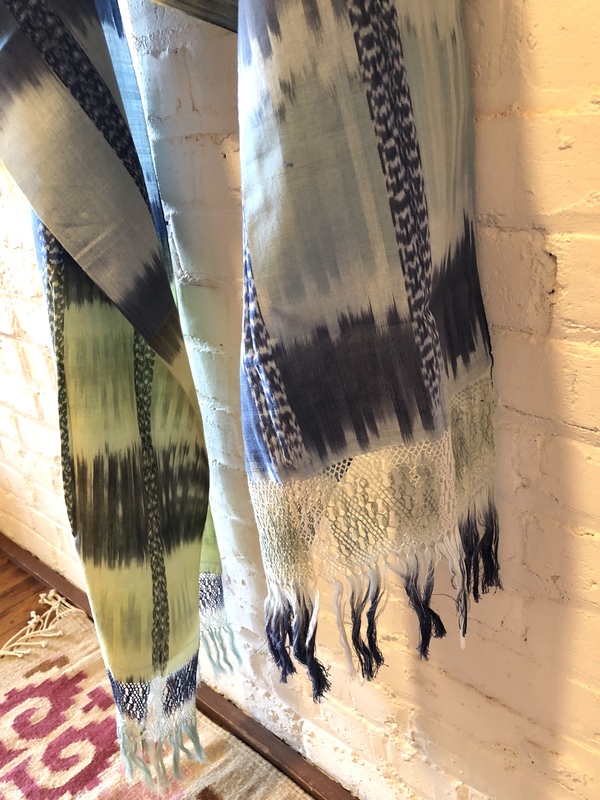 This #6 ikat scarf features warp threads dyed with indigo and wild marigold. 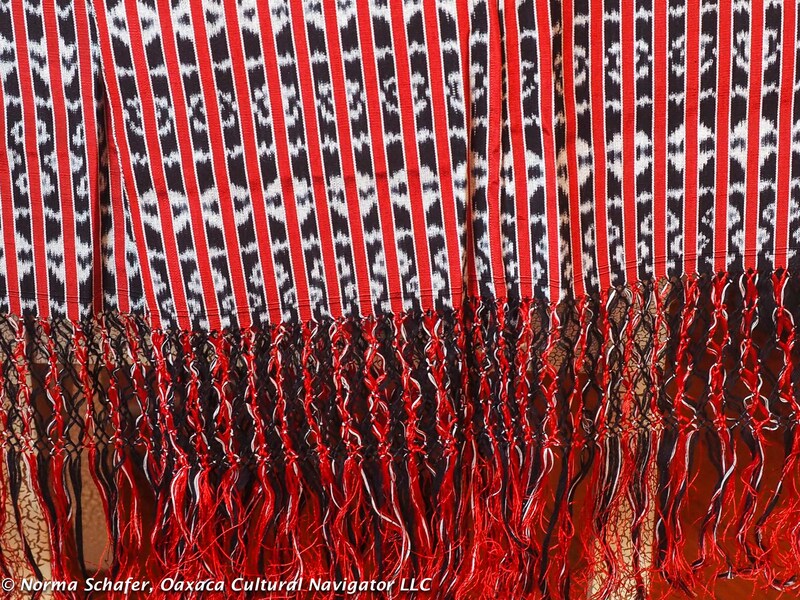 The pattern created on the loom looks like a Matisse painting. 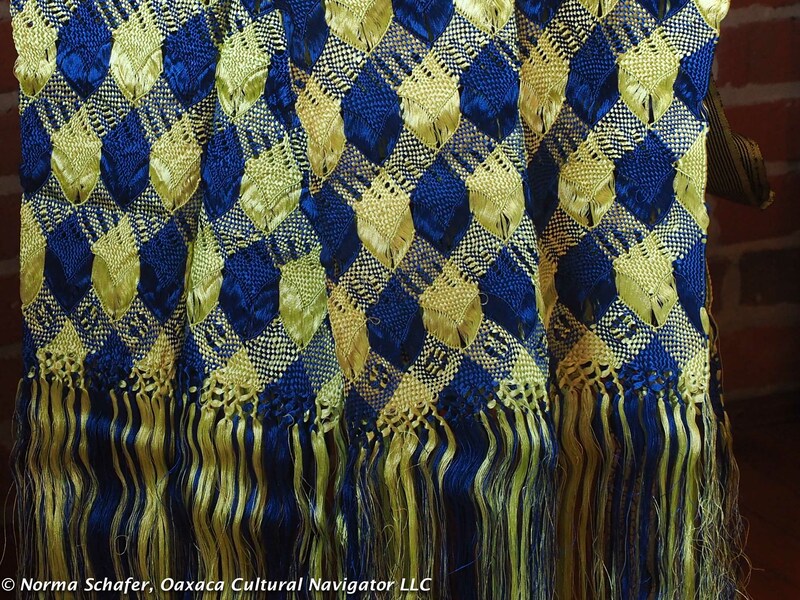 The blue and yellow together offer a range of shades from yellow to chartreuse, a great compliment to the indigo blue. 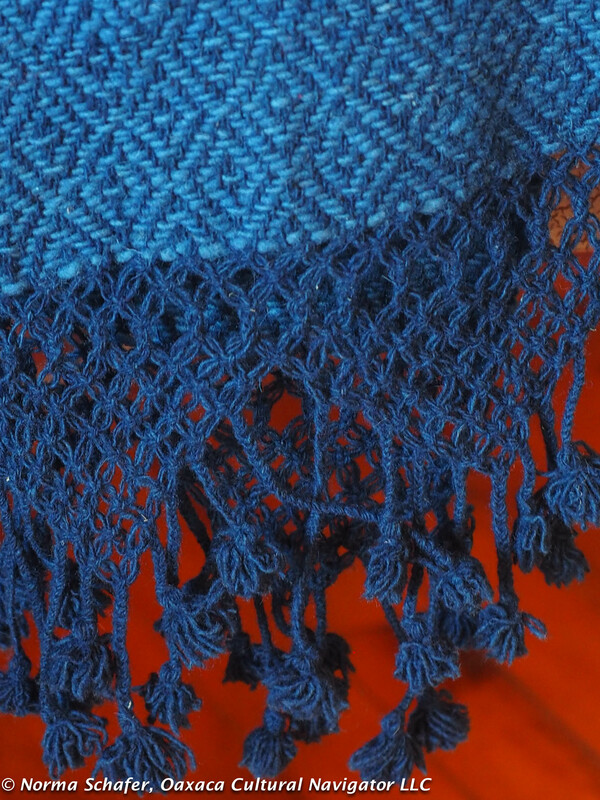 The punta, or fringes, are hand-knotted. 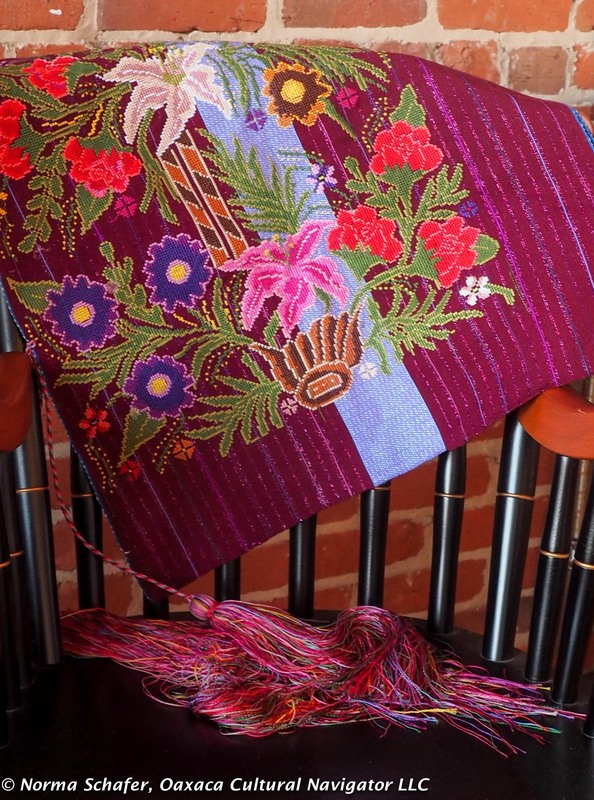 Measures 16-1/2″ wide x 72″ long. $75 USD. 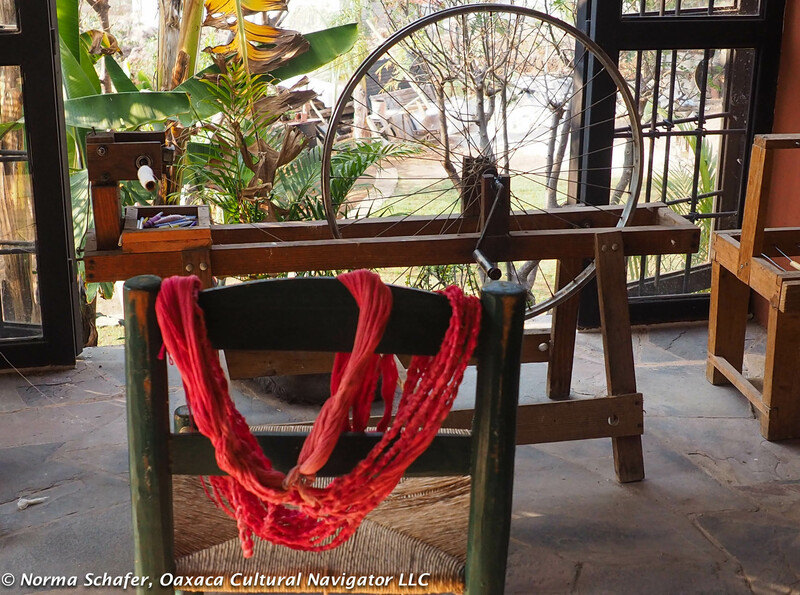 #7 is a luxuriously soft native brown coyuchi cotton hand-spun on the charkha — Ghandi spinning wheel — in the Oaxaca mountain village of San Sebastian Rio Hondo. 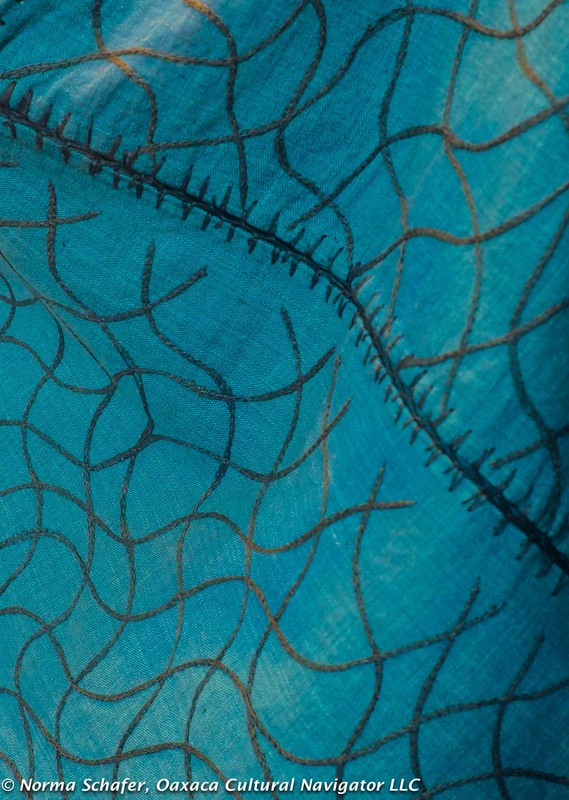 The intricate needlework trim and joinery is forest green. 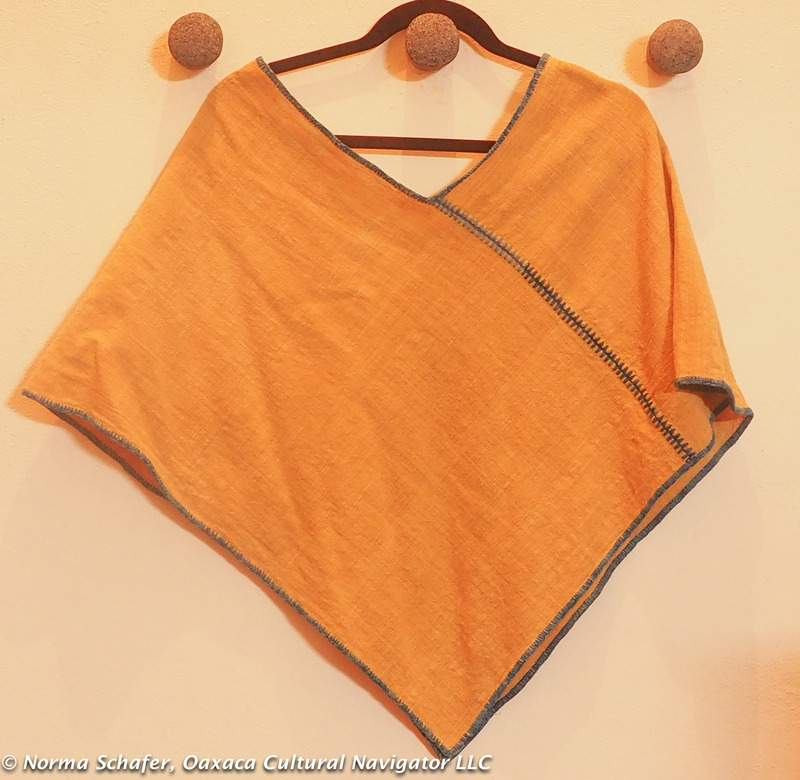 The quechquemitl is a pre-Hispanic Mesoamerican garment favored by women as an over-the-head short poncho. 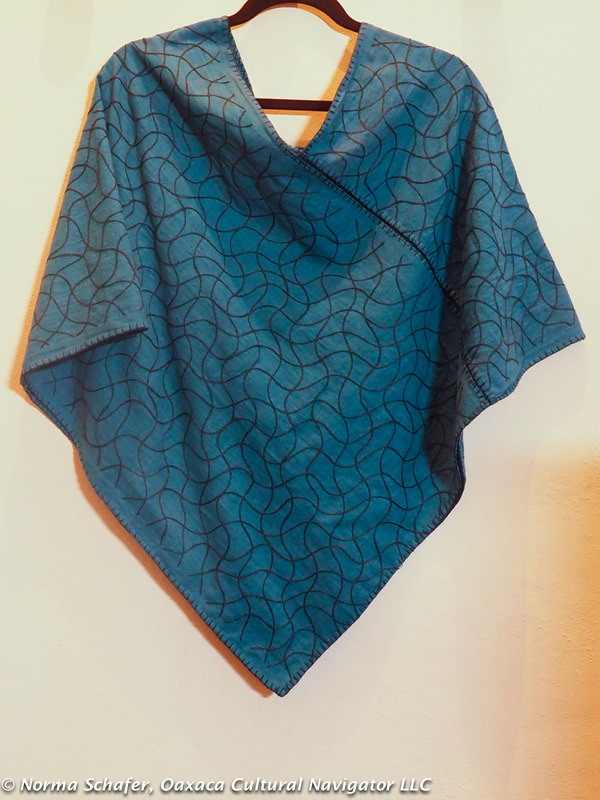 I call it a pull-over scarf. 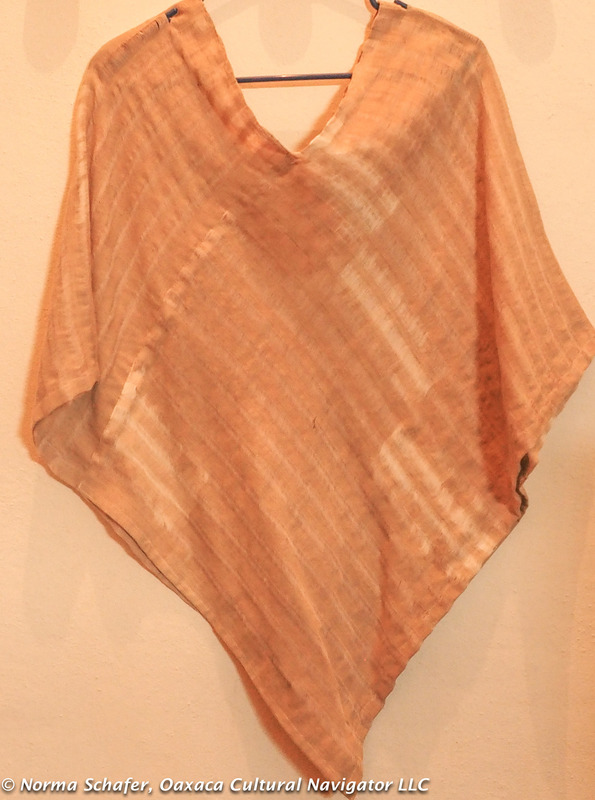 It is perfect to wear of an evening or to cover the bodice or shoulders of a sun dress. 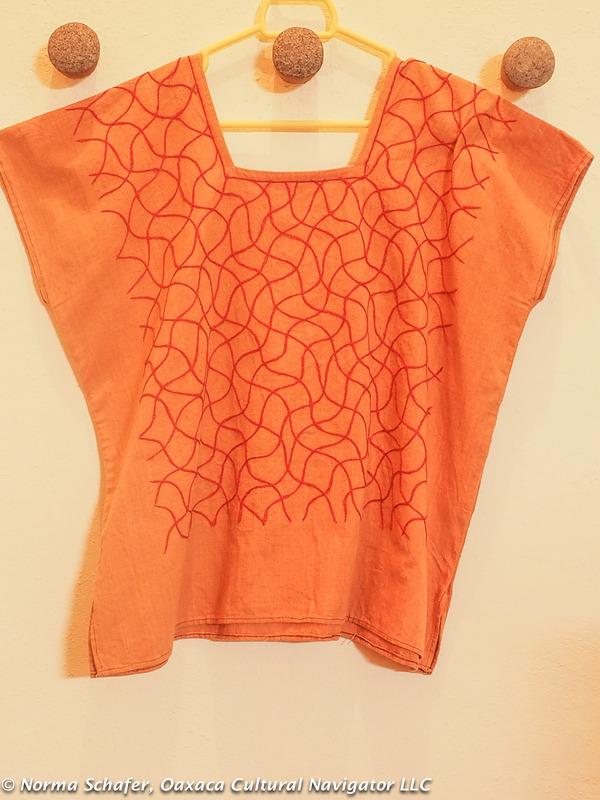 Measures 21″ long from the V-neck to the point and 31″ wide across the front. Rotate it to get a different look. 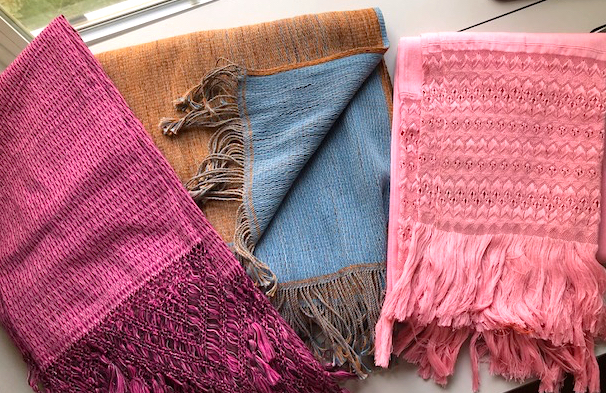 Wear it like a scarf, too. $95 USD. 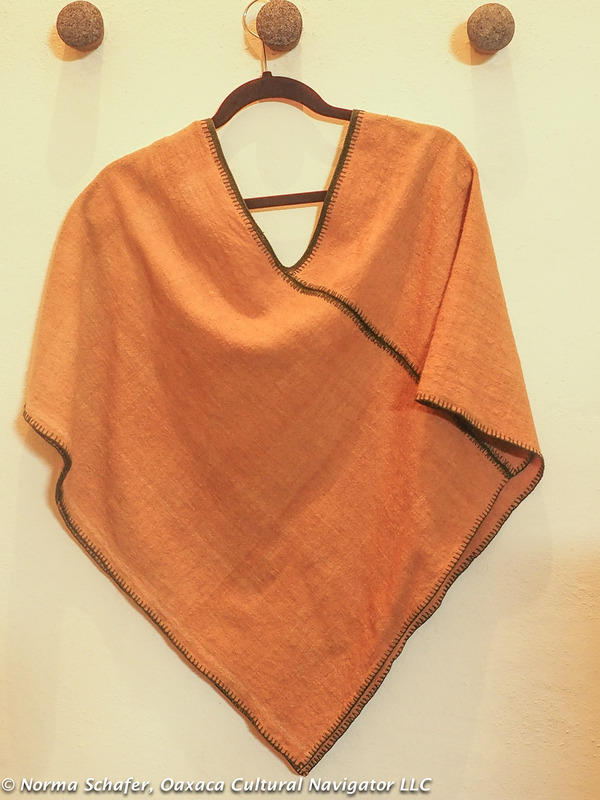 #8 SOLD Quechquemitl combines cotton dyed with Oaxaca-grown indigo and native wild marigold flowers. 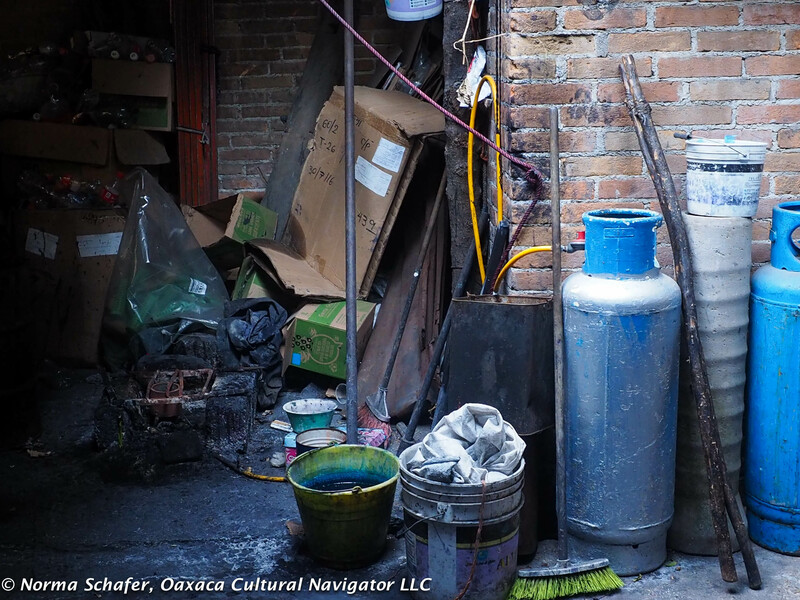 The iridescent color combination sometimes tricks you into thinking there might be some green in there. 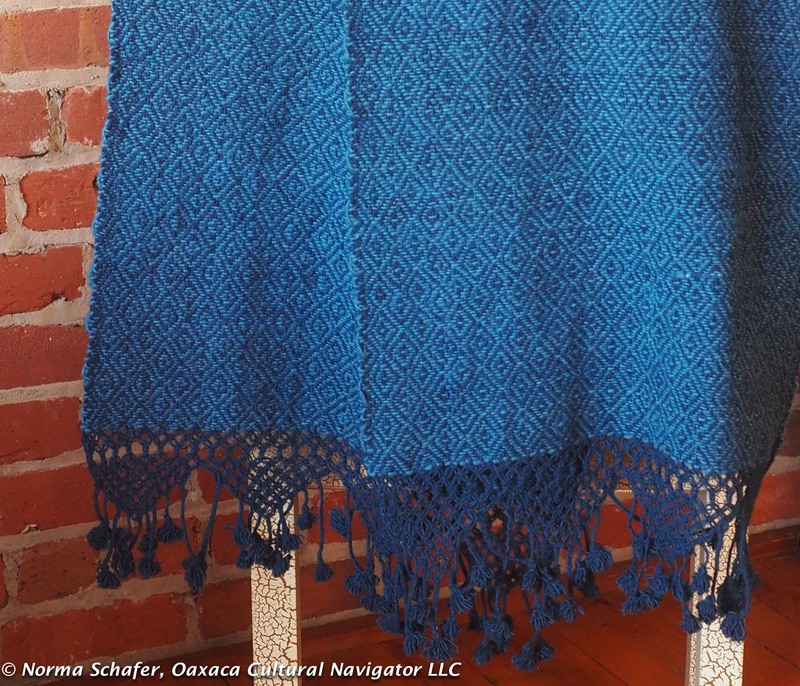 Because the cotton is hand-spun, it offers beautiful texture and slubs. 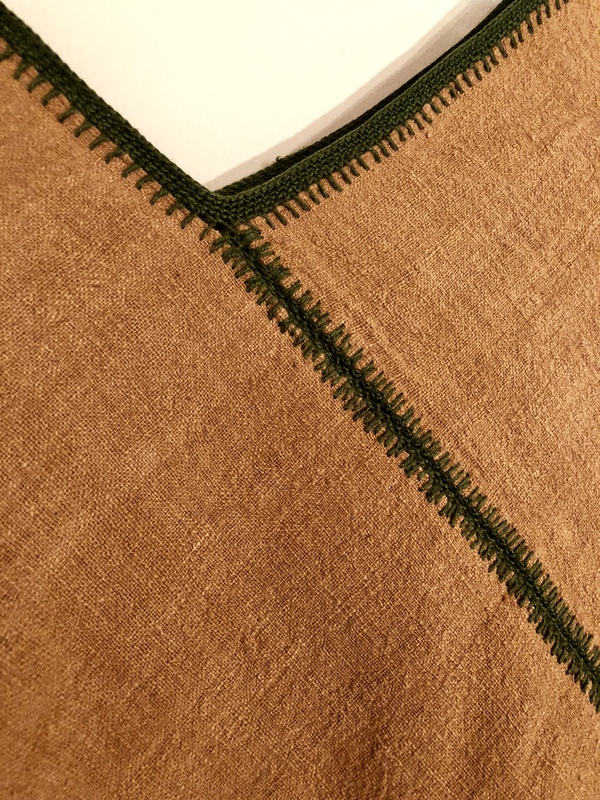 Similar measurements as #7. $85 USD. 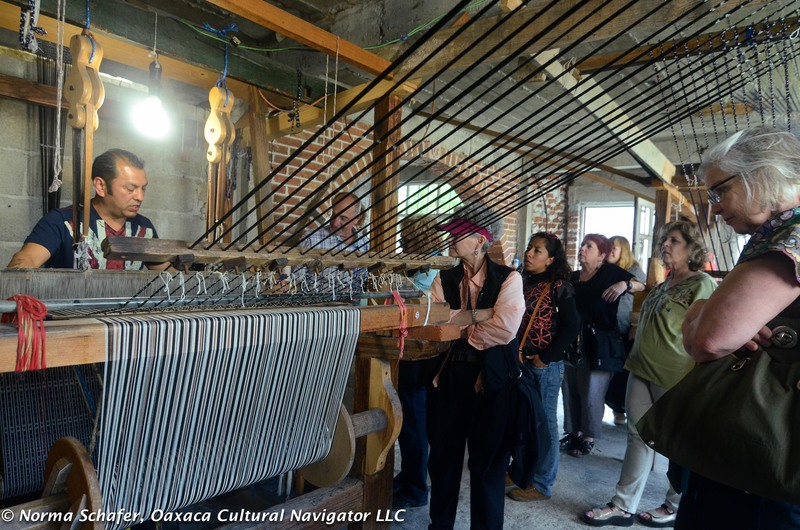 On our textile study tour to Tenancingo de Degollado, Estado de Mexico (State of Mexico) we met ikat rebozo weavers, called reboceros, who use up to 6,400 cotton warp threads on a back strap loom. 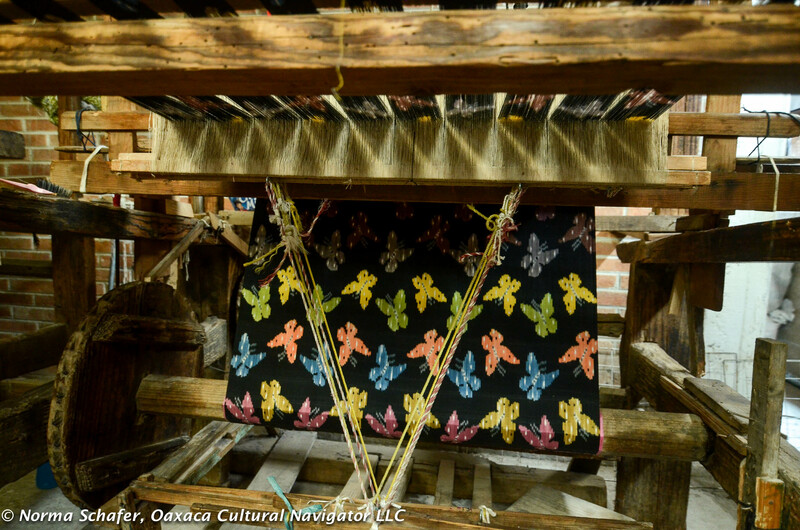 About 3,000 to 5,000 cotton warp threads are used on the fixed frame pedal floor loom. The technology is simple. 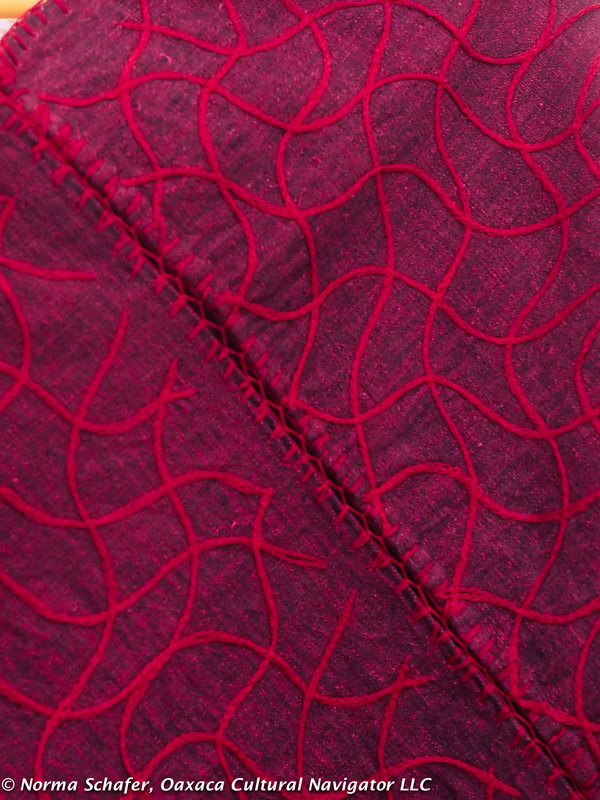 The fabric created is complex. The floor loom is faster. 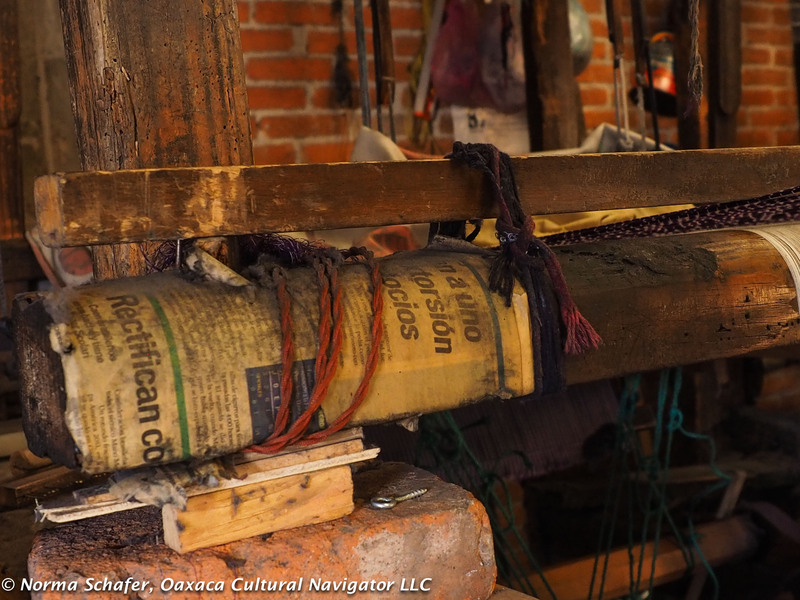 Weavers can produce a rebozo in about a week using this loom. 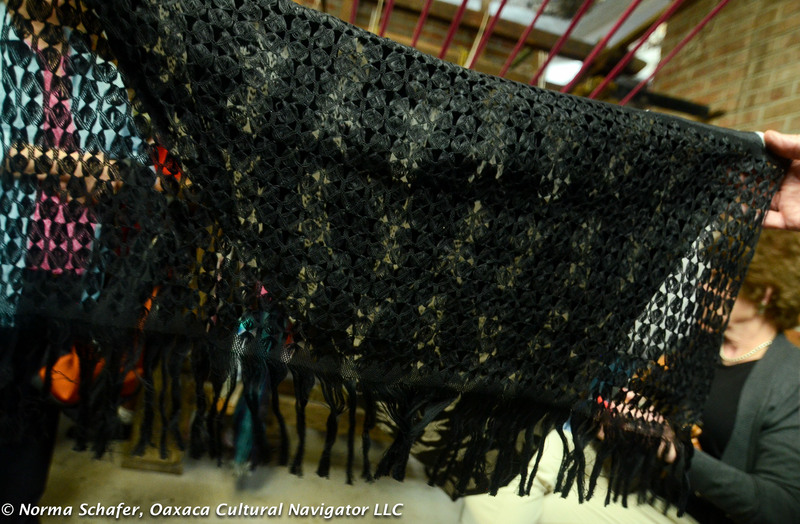 It takes three months or more to make a rebozo on the back strap loom. 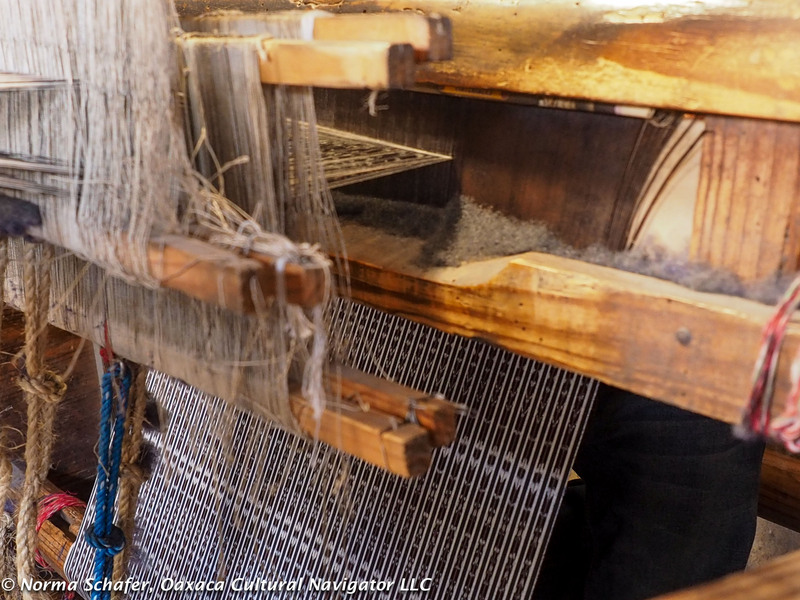 Because fewer warp threads are used on the floor loom, the cotton threads can be thicker and the finished cloth might be coarser. 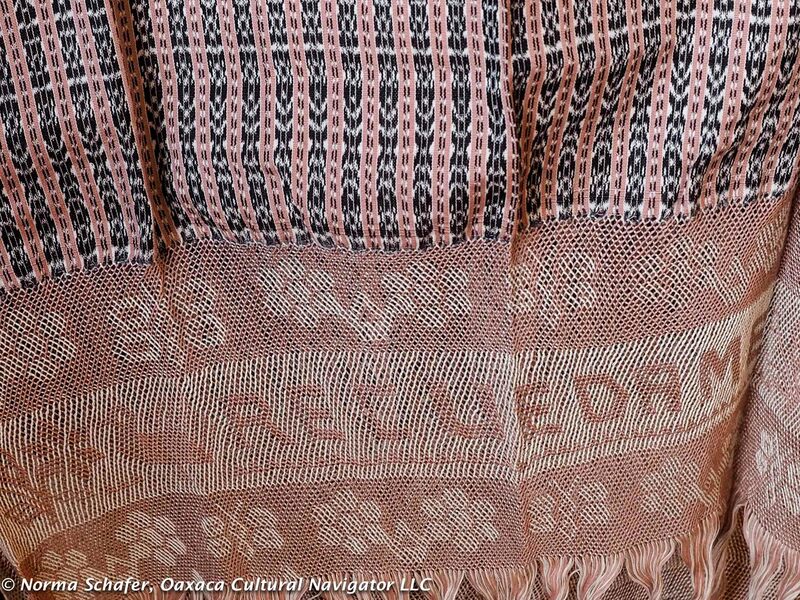 As you might imagine, the cost for a rebozo made on a back strap loom is much more than one woven on a pedal loom. 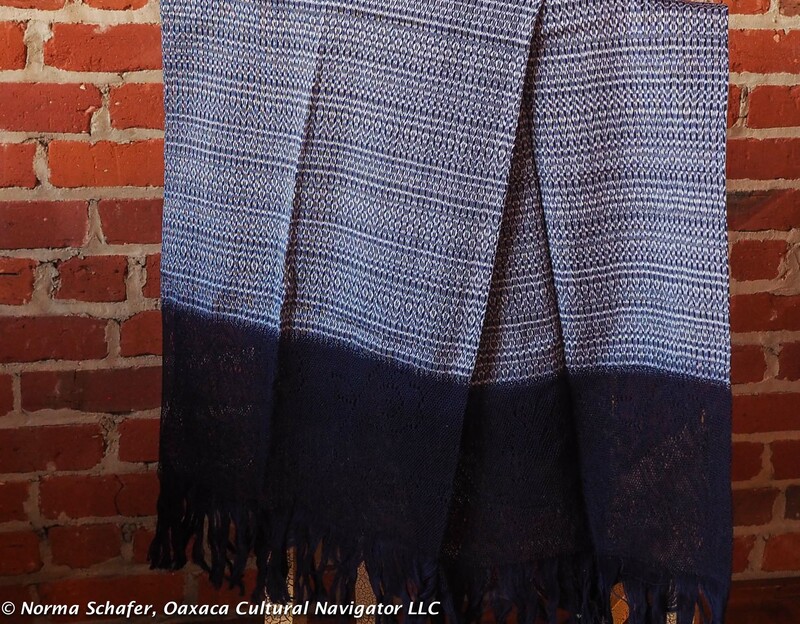 Except for the rebozos woven by Jesus Zarate! 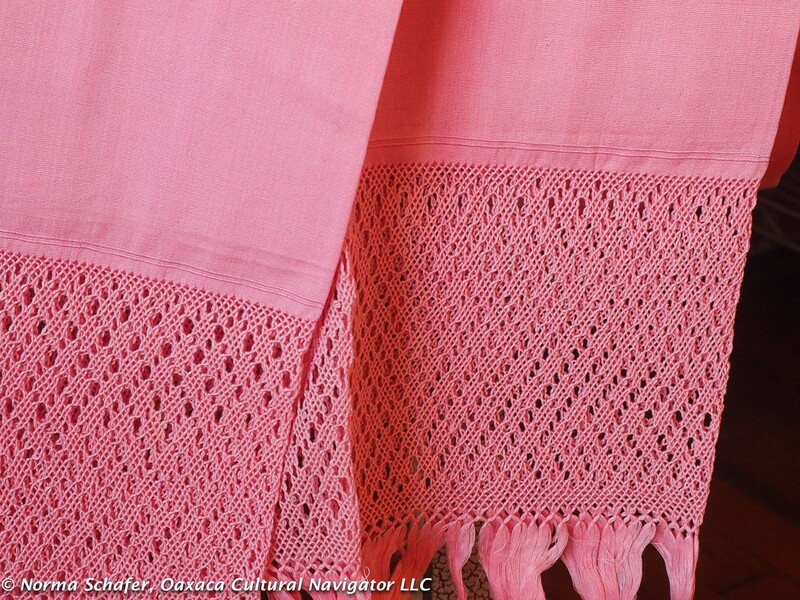 What do rebozos cost? From 400 to 16,000 pesos. Would you work six months to earn $800 USD? 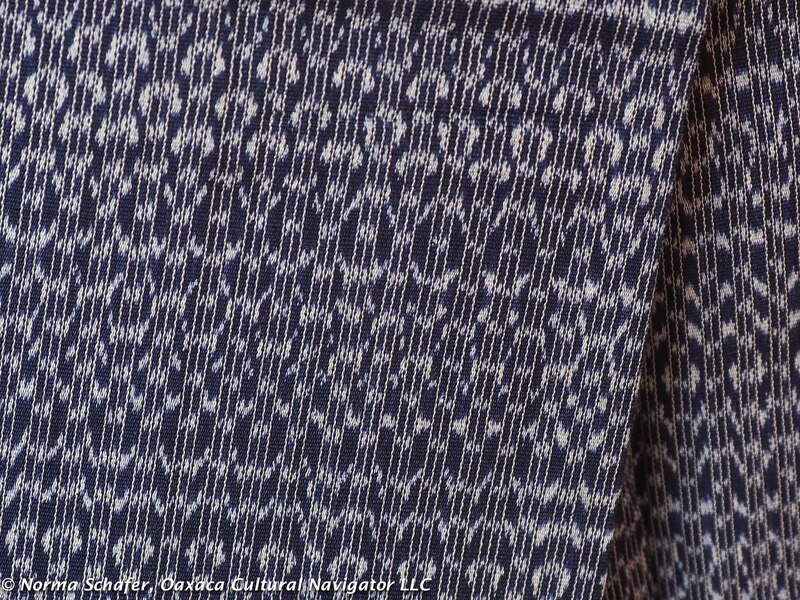 The pattern can be more blurred and not as detailed as those created on the back strap loom. 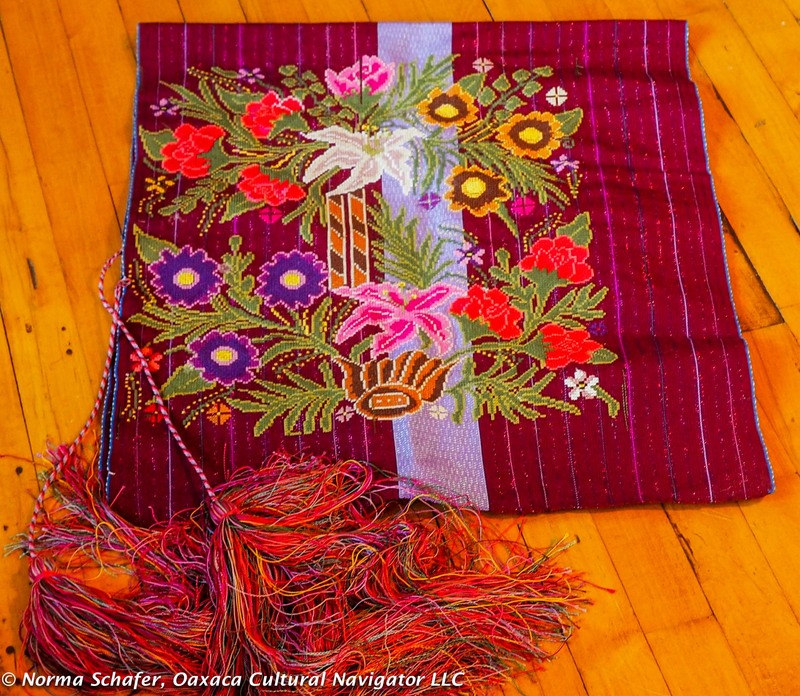 Except for the rebozos woven by Jesus Zarate! 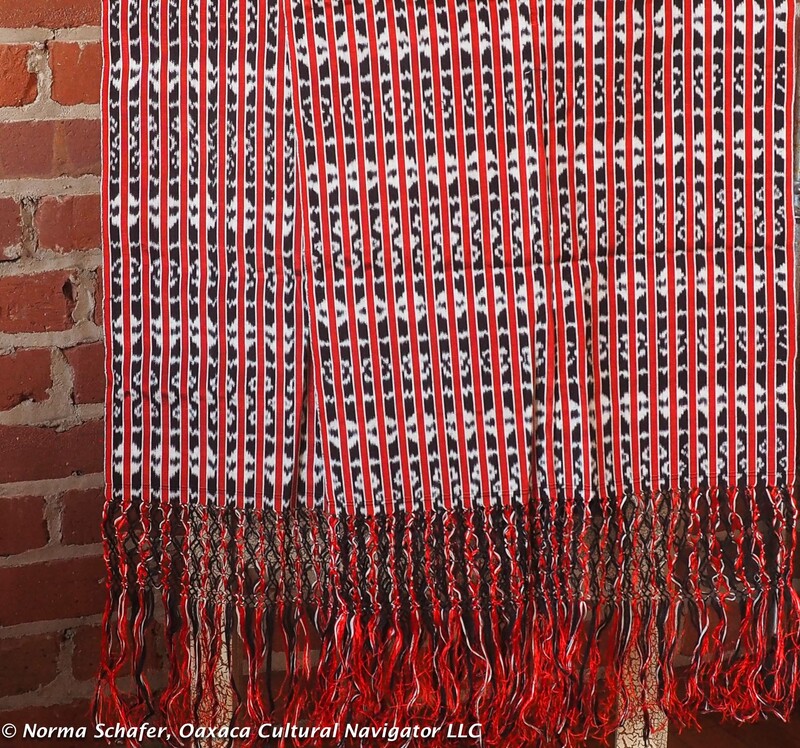 There are fourteen different steps required to make an ikat rebozo. 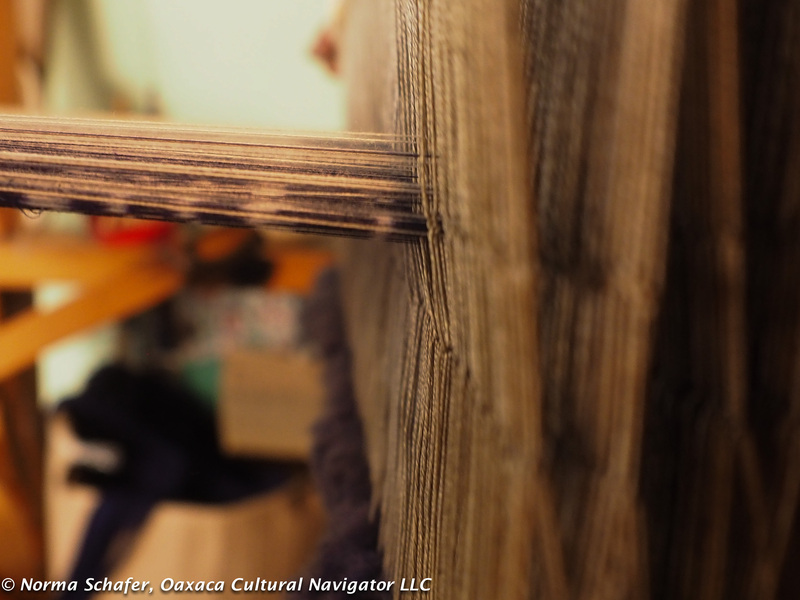 The most difficult and time-consuming part is the preparation of the threads before they are dressed on the loom. 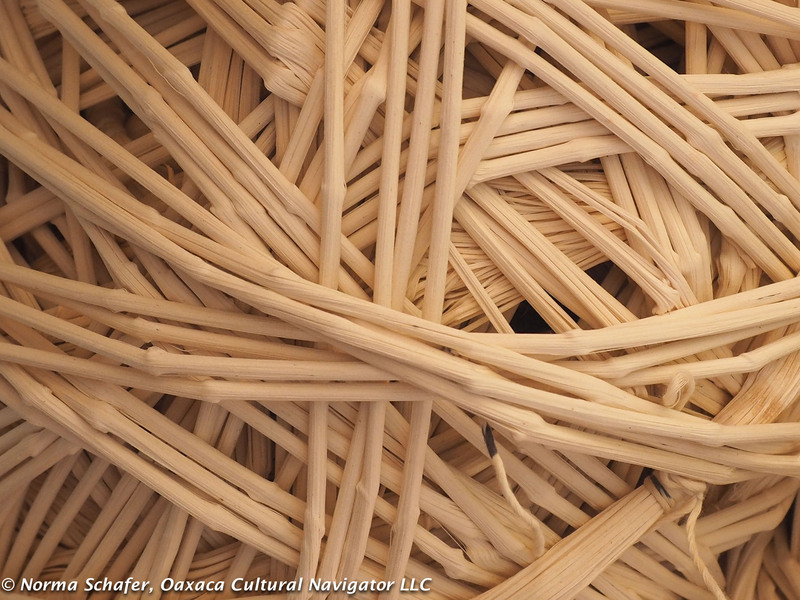 Threads are soaked in starch to dry and stiffen before marking. 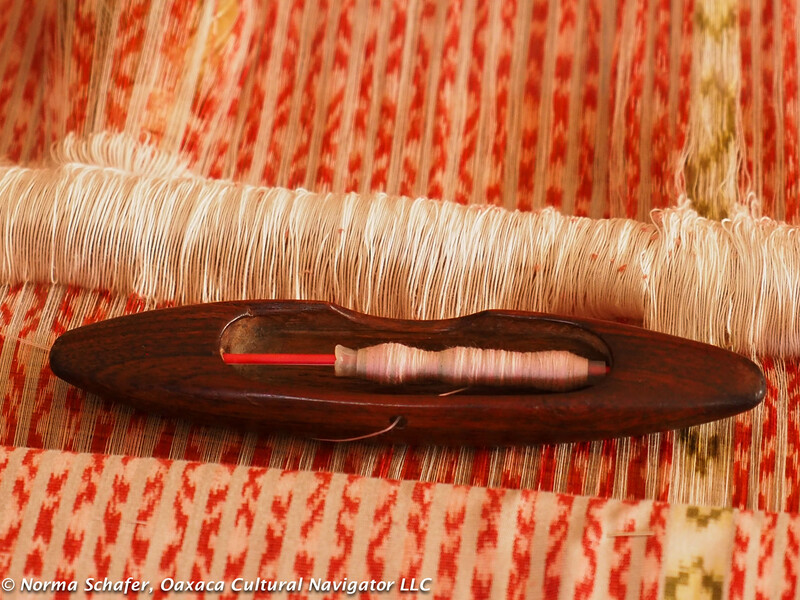 Ikat pattern markers are coated with ink, rolled along stiffened cords. The weavers we met all repeated that the actual weaving is the simplest part of the process. 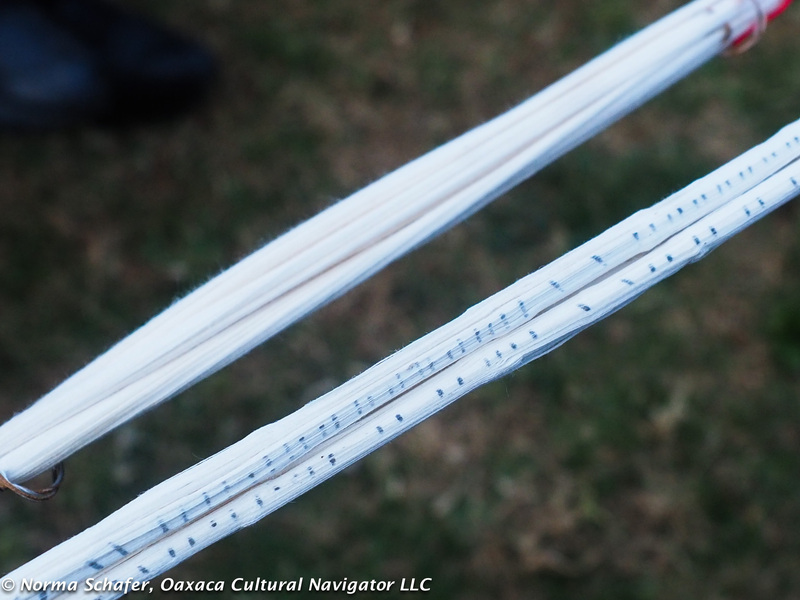 Once the cords are marked in ink with the pattern, each mark is hand tied. 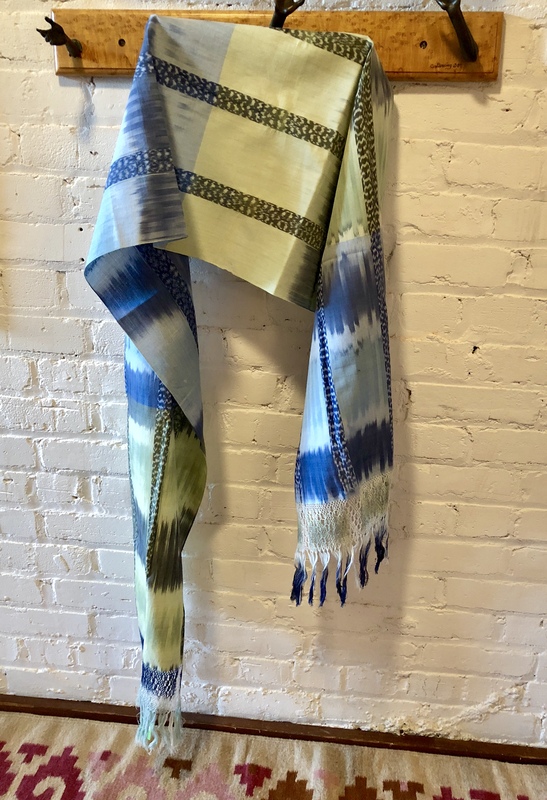 The cloth will then be dipped in the dye bath. 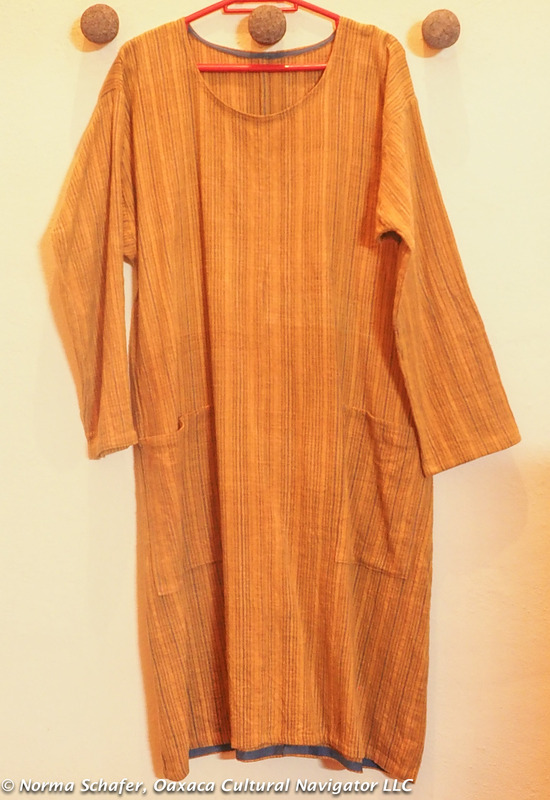 It is then washed and dried. 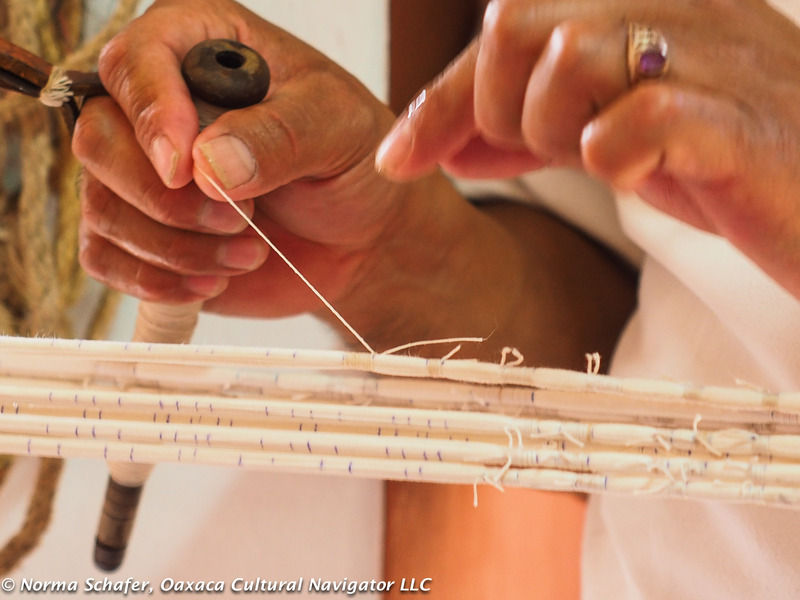 The knots are cut and the pattern emerges on the warp thread, ready to be threaded on the loom. 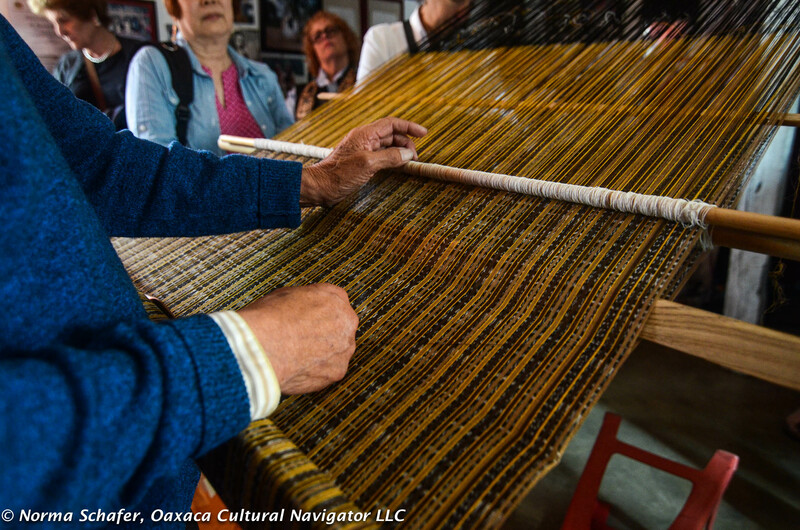 For rebozos with multiple colors, they can be hand-dipped in the dye pot or the part that is already colored will be tied off so it does not absorb the new color. 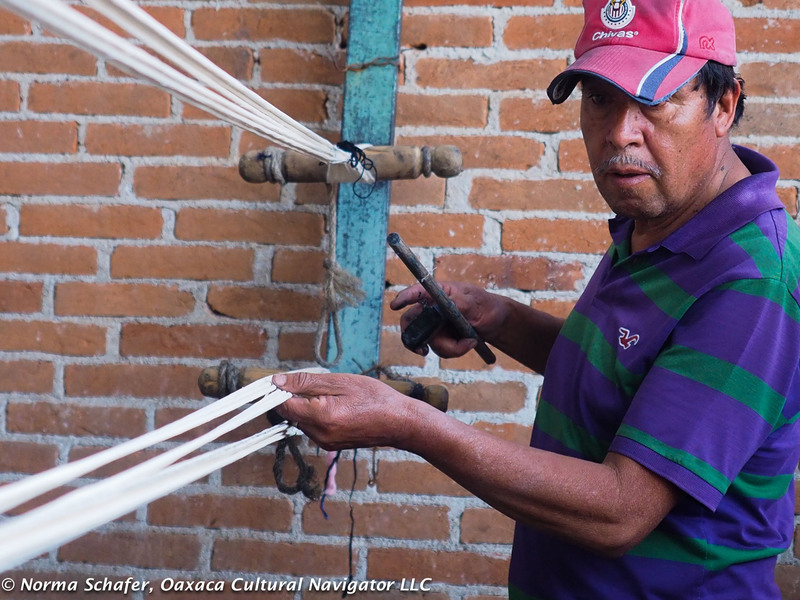 The loom might be considered low technology, but it is a complex system for making cloth. 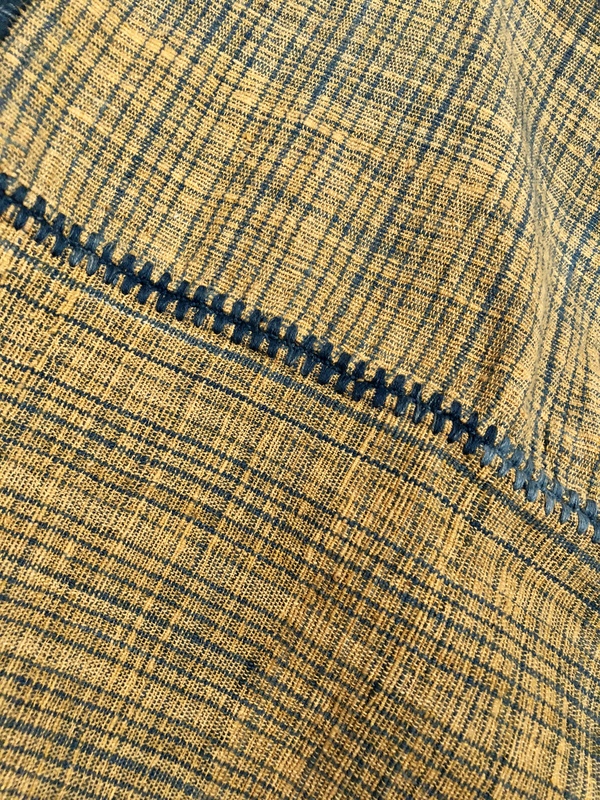 Today, industrial cloth is made totally by machine. 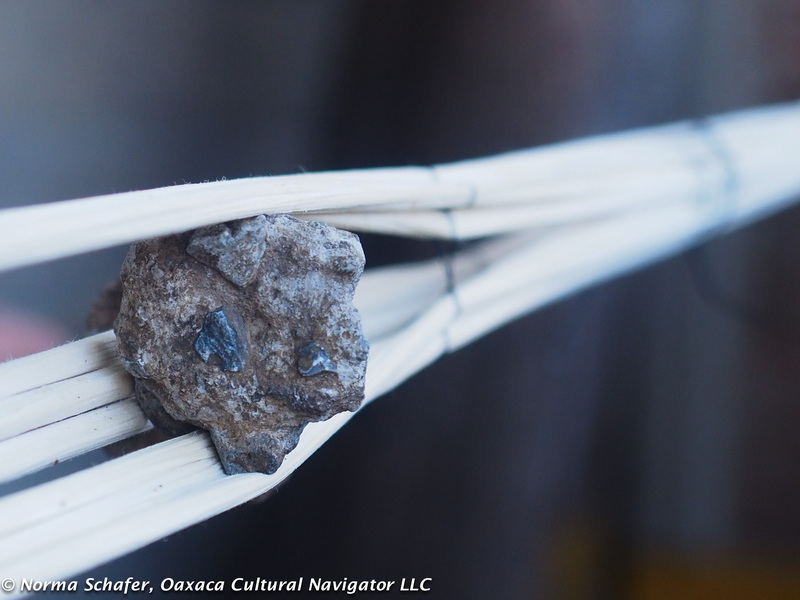 We are interested in the hand-made process. 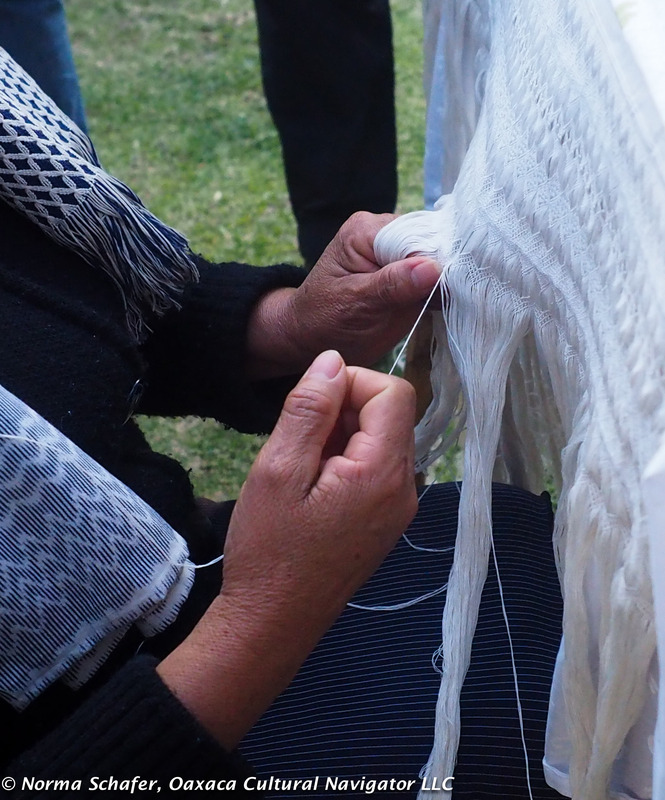 Knotting the rebozo can take equally as long as weaving it — three months or more, depending on intricacy. 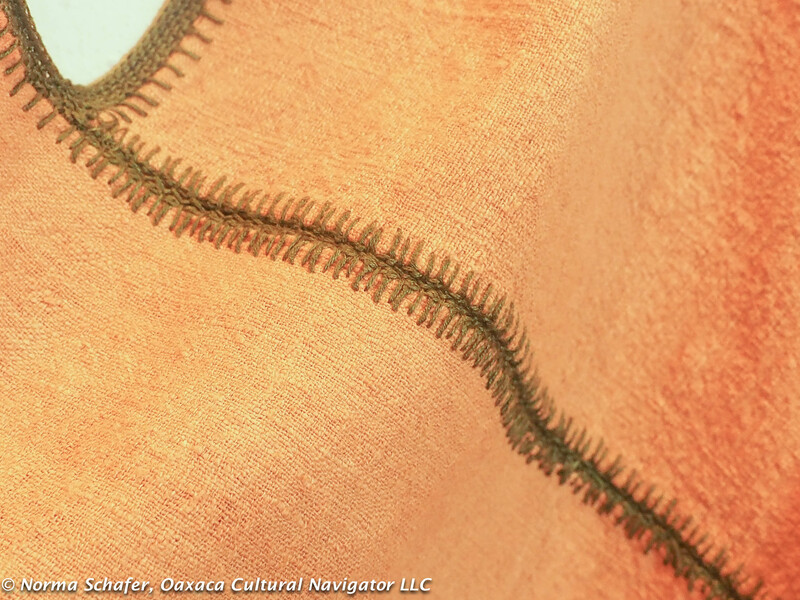 We know one enpuntadora who takes a year to tie a complex fringe.